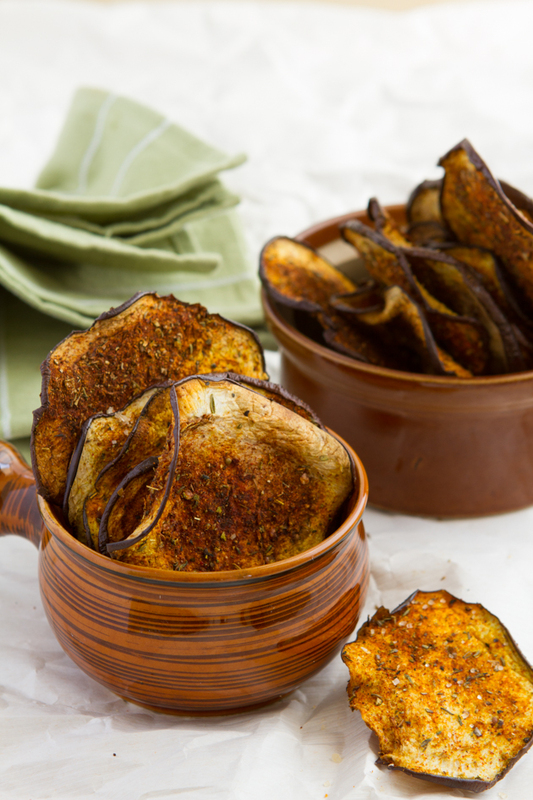 Thinly sliced eggplant rounds sprinkled with homemade smoky seasoning and slow roasted until crisp. Preheat oven to 250F and set aside 4 large cookie sheets. Slice the eggplant using a mandolin slicer or a sharp knife. The slices should be as thin as a potato chip. Place completed slices on cookie sheets. Once all slices are on the sheets, spray with coconut oil or avocado oil spray on one side. Then, sprinkle each slice with seasoning. 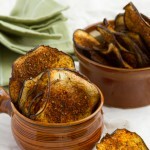 Once complete, flip over each eggplant slice and repeat with a spray and season. Place in the oven to bake for 50-60 minutes, depending on how thin you sliced them. If you make them too thick, they can take upwards of 2 hours to complete.